Rocking your dad's classic leather jacket from the 70s but actually concerned with what will happen to your body in a crash? 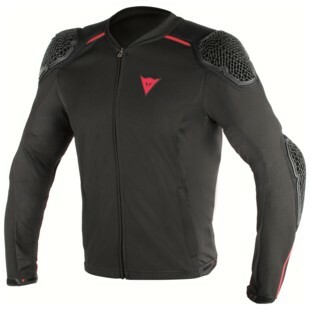 The new Dainese Pro Armor Jacket aims to solve the issue of what to do when you have an armor-less jacket but do not want to spend ten minutes gearing up for every ride by integrating a full set of CE-rated armor onto a comfortable base layer. The jacket itself is made from thin, stretchy, mesh material that is designed to fit close to your skin and keep you cool and has the new Dainese Pro Armor integrated into it. Gone are the bulky composite armor pieces of old and in comes the new, nitrile-weave-type armor that, although very thin, affords you CE-level 1 protection in the shoulders and elbows and CE-level 2 on the spine. The Dainese Pro Armor Jacket for Spring 2017 makes protecting yourself easier and more comfortable than ever.